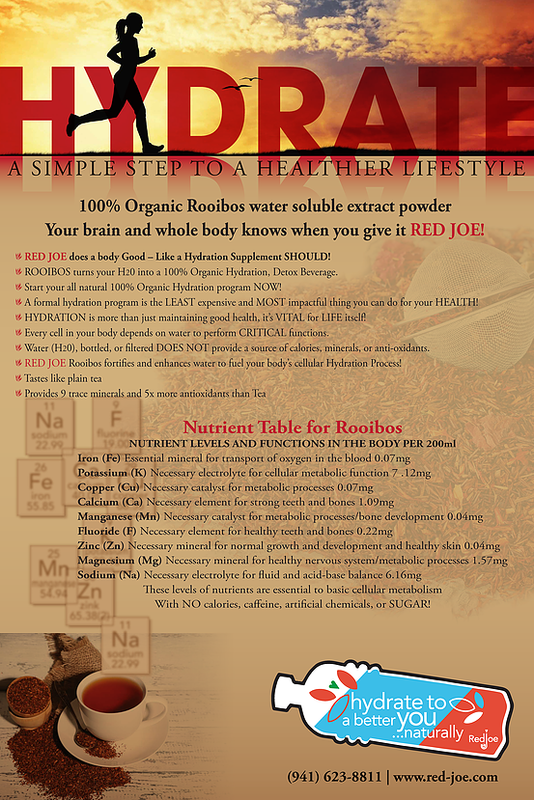 Red Joe is a water soluble, concentrated powder made 100% from the fermented Red Bush known as Rooibos. Red Joe is the perfect replacement for all the sports and energy drinks which are laden with caffeine, calories, chemicals, fats, sugars and oils. Red Joe supports hydration at the cellular level, along with many other health benefits. Unlike coffee, caffeine-containing soft drinks and many teas, Red Joe is not a diuretic. Instead of robbing our bodies of hydration, Red Joe has key electrolytes and rehydrates the body throughout the day. Simply dissolve in water, juice or your favorite healthy beverage. Enjoy Red Joe hot or cold, with or without honey and/or lemon. Drink normal quantities throughout the day to stay refreshed and hydrated. You can also replace liquids in recipes with Red Joe. Rooibos doesn’t deteriorate in taste or appearance when heated or refrigerated. Just add one package to 16-24 ounces of water and shake. Add almond milk and honey as a sweetener for a delicious hot beverage instead of coffee or tea. Mix into smoothies for an antioxidant boost!